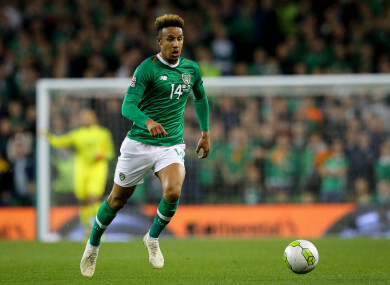 OF ALL THE players in the current Ireland squad, few if any have looked as impressive for their clubs this season as Preston’s Callum Robinson. The 23-year-old has produced seven goals and two assists already in the Championship since the beginning of the campaign. His Preston side sit 18th as a result of a disappointing start, but a recent improvement has seen them go unbeaten in their last seven matches, having lost the same number of games in their opening 10 fixtures. Robinson has yet to score or taste victory in four appearances for the Boys in Green, however, though he is hopeful he can build on his encouraging club form in upcoming matches versus Northern Ireland and Denmark. Robinson, who is capable of playing up front and on the wing, has already equalled his Championship goal tally for the entirety of last season, and he suggests guidance from Lilywhites boss Alex Neil is a major reason for his improvement. “Last season was the gaffer’s first. As the season was going on, I was getting stronger and learning. Now I get what he wants and this season, I’ve gone into it and he’s believed in me and I’ve played a lot of minutes. “He’s getting me in great areas where I can [hurt] teams. And that’s it. “The lads have been doing great now, the last seven games unbeaten, that’s going to help me with goals and assists. It’s been a good start personally and now we’re picking up in the league as a team. Robinson’s Preston and Ireland team-mate Sean Maguire, meanwhile, has yet to find the net in the Championship this season, though a pre-season injury has meant he has made just six appearances in the campaign so far. It is no surprise, however, that Maguire’s return has coincided with an improvement in the team’s fortunes, and the former Cork City striker looked particularly sharp in the 1-0 defeat of Bristol City at the weekend. And Maguire is not the only Irish player that Robinson is a big fan of. The young attacker also reserved high praise for Preston midfielder Alan Browne at Tuesday’s press conference. In contrast with Robinson, the season has not gone quite so well for fellow Irish attacker Aiden O’Brien. His Millwall side are only outside of the Championship relegation zone on goal difference and while the 25-year-old has appeared 15 times in the league for his club, six of those have been off the bench, while he has completed 90 minutes just twice. “Football’s a funny game,” O’Brien says. “One minute you’re flying, next minute you’re on the bench. It is what it is. There has been one obvious positive amid this frustrating period though, with O’Brien scoring on his international debut in a friendly against Poland last September. “I don’t think I’ve gone to sleep without thinking of it to be fair,” he laughs. Email “Ireland striker Callum Robinson: 'I've been in the best form of my life'”. Feedback on “Ireland striker Callum Robinson: 'I've been in the best form of my life'”.